At first I wasn't very excited about this postcard I saw on eBay. Sure, it advertises Sandy Koufax's Tropicana Motor Hotel in Hollywood, but failed to show Sandy anywhere on it. So, I initially didn't see the big deal. But then I wondered, why was it listed at nearly $500.00? So, I figured I should do a little bit of research on this establishment just in case something interesting popped up, and... well... something fascinating immediately emerged. 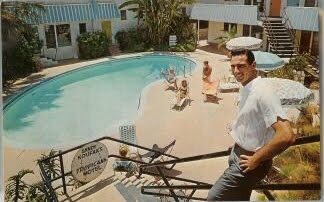 In 1963 the motel was sold to its fourth owner, soon-to-be Hall of Famer Sandy Koufax, strikeout artist of the Los Angeles Dodgers. Being a smart businessman, he immediately changed the sign to read “Sandy Koufax’s Tropicana Motel,” which brought in a whole new clientele. The culture shifted, too, and the movie stars morphed into television stars and rock gods. From 1963 onward, the Trop functioned as a boho playground, pioneered by Jim Morrison of the Doors, who hung around the Palms, a low-rent (and nearly as infamous) dyke bar located directly across the street from the Tropicana. He would drink there all night before stumbling across the street to pass out. Mornings after, he’d write many of the songs that became hits for the Doors. Waves of other musicians arrived and followed the same hit-making formula. The motel was also the site of numerous photo sessions and legendary band interviews, and it served as the location for the Andy Warhol films Heat and Trash. The party kept going until 1988, when the building was razed and replaced with a Ramada Inn. Holy Moly! You can get from Jim Morrison to Sandy Koufax in one degree of separation. Former residents and guest include the who's who of rock music. Morrison lived there for an extended time, and so did Tom Waits. Janis Joplin (who was found dead there), Lou Reed, Johnny Cash, Blondie, Elvis Costello, Van Morrison, the Ramones, the New York dolls, the Cramps, Bruce Springstein, Eddie Cochran, the Beach Boys, Jim McGuinn of the Byrds, poets William Burroughs and Alan Ginsburg, Dennis Hopper, Evel Knievel, Iggy Pop, the Damned, the Clash, the Germs, Led Zeppelin, Van Halen, Red Hot Chili Peppers, Guns and Roses, Bob Marley and the Wailers, Alice Cooper, KROQ's Rodney Bingenheimer, and Frank Zappa were frequent guest and partiers at the Tropicana. I have no idea how long Koufax owned the hotel. It's likely he didn't run the place for very long. Nevertheless, he will always be connected to a rich musical history. His establishment was the stomping group for many artist and musicians who would soon become major international stars. Like Sandy, many of them would eventually be enshrined in their own Hall of Fame. BTW, here is another postcard from the Tropicana that does feature a dapper Sandy Koufax. Still, $500.00 for the above postcards is a large overreach. Anyone know where I can find a copy at a more affordable and reasonable price?